The purpose of Rhumb Line is to keep you up-to-date with new additions to Great Lakes Sailing in a brief, easy-to-scan and concise manner. I value not only your interest but also your time. 5. Tsunamis On The Great Lakes ?? Following the coastline as closely as possible, we wandered through all of the ports detailed on the website and more. In Cape Vincent, we enjoyed the french pastries they are so well-known for. Two-dollar beer on a patio overlooking Sackets Harbor on a warm afternoon was a treat. We watched a very severe thunderstorm blacken the afternoon sky from the docks at Sodus Bay and poked our way along through Henderson Bay and into Pultneyville. And so it went as we wound our way to Wilson, an excellent, well-protected harbour. The QEW Highway was jammed from an accident but we didn't notice it as we passed Burlington's waterfront with its impressive Naval Ships Memorial (which lists every one of the 527 war ships and 370 merchant ships that sailed under the white ensign or red duster). The route took us along Lakeshore Blvd past the harbours in Bronte, Oakville and Port Credit. And before we knew it, a most enjoyable exploration of ports from the land side was over. All along the coastline, we found interesting places to visit, great pubs and restaurants and warm, friendly people. I am sure that we would find much the same around each of the other Great Lakes. It was a trip well worth taking. As I write this, the Canadian Coast Guard, along with other agencies, is searching for a sailor missing and possibly lost on Lake Ontario. He was apparently sailing solo and his boat was found washed ashore. That is a tragedy for both the sailor and his family. My purpose in raising this is to highlight once again the absolute necessity of having an attitude of awareness, preparedness or mindfulness concerning your safety on the water. Great Lakes Sailing's section on sailing safety discusses safety but I want to focus on just a couple of things. U.S Coast Guard statistics show that 73% of boater fatalities were due to not wearing a lifejacket. I believe that when sailing at night, a lifejacket should always be worn. The Great Lakes are cold and debilitating hypothermia can set in quickly. My preference has always been for a full lifejacket vs the inflatable type. The later relies on either a mechanical inflation device or manual activation, either of which can go horribly wrong. A full lifejacket relies on .... nothing. Its doing its job the instant it hits the water. Plus all that insulation around your body can help preserve body heat. 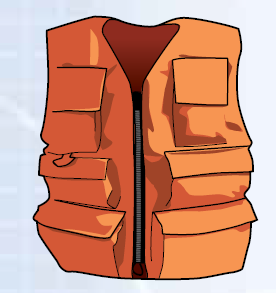 A lifejacket usually has a loop where you can attach a water-activated strobe light. Pockets can hold some small personal flares or a pair of wool gloves (wool is the only fabric that will retain body heat even if soaked). Along with a lifejacket, a safety harness is vital if you are sailing at night, especially solo. It permits you to move around the boat while keeping you firmly attached if you slip or get thrown off your feet. Of course, a properly rigged jackline is necessary too. The jackline should run from bow to stern and have nothing else attached to it. If you can't run one down the centreline of the boat, rig 2 – from the bow cleat to each stern cleat. Make sure you have 2 safety tethers on your harness. Never unclip from one tether until you have clipped the other tether onto the other jackline. While sailing is a wonderful experience, you can never lose sight of the inherent risks. Keep the U.S Coast Guard's mantra in mind - “Be Aware – Pay Attention”. Weather is the real 'Greatest Show on Earth'. It lies at the heart of sailing. MeteoEarth is the largest private weather forecasting firm in Europe. They have a stunning representation of the earth and its weather on their website. The globe can be paused, rotated and zoomed. There are a number of 'overlays' that a viewer can select. The sun's location can be followed and, as night falls, you can see the lights of urban areas begin to glow. It's a loads a bit slowly because it has so much but you can enjoy it here. Among the many types of buoys you may encounter as you sail the Great Lakes is a big, yellow buoy, bristling with antennae. 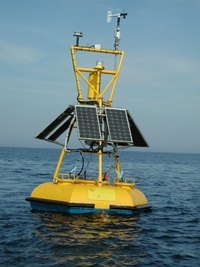 This is an ODAS Buoy – “Oceanographic Data Acquisition System". What the various instruments do is gather information such as water temperature, air pressure and temperature, wind speed and direction, average wave height and wave period. The information is then transmitted to a satellite where it is download by various oceanographic institutions such as NOAA or Environment Canada. NOAA operates the 'National Data Buoy Center' where this information is collated and made available to the public via their website. It is a terrific source of information for sailors planning a cruise. When the map loads, just zoom in to the Great Lakes. Check it out here. We have heard of sharks in the Great Lakes. (It was on TV – so it has to be true!!! Right?) How about tidal waves? Well, in fact something similar can occur and did so on Sept 4th on Lake Superior. 'Fetch' is the length of water over which a wind blows. On a lake such as Lake Superior, fetch could conceivably be 350 mi/563 km. The end result of this can be a lot of water 'piled' up against the lee shore. This is what happened the first week of Sept this year. After a lengthy southeast wind, a line of thunderstorms came through, with a resulting shift of winds now coming from the west. The water began to rush back eastward. This phenomenon is known as 'seiche' (pronounced SAYSH). The result was a a wave 5'5” high hitting Sault Sainte Marie! I don't know about sharks, but the Great Lakes do indeed have their version of a tidal wave. If you like this newsletter, please do a friend and me a big favor and "pay it forward."